A credit report is a record of your financial history. It is a modern day measure of your reputation or “credit worthiness”. It is used by lenders to determine how likely you are to pay back the money you have borrowed. When you make a payment on a credit card or loan, the company that gave you the loan or credit keeps a record of how much and often you pay. Those companies and other sources also report your credit, loan and payment history to one or more credit reporting companies. 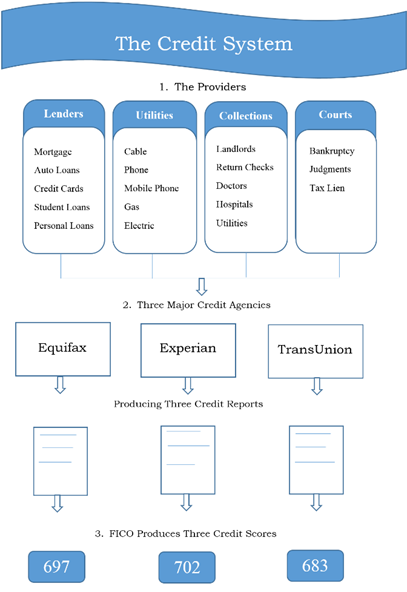 The three credit bureaus are Equifax, TransUnion and Experian. Because of federal law, you can check each of these reports for free one time per year at annualcreditreport.com. 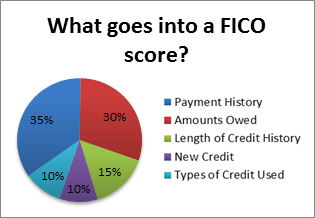 The FICO® Score is computed using software created by Fair Isaac and Company which is another tool used by lenders to determine how much money you can borrow and how much interest you’ll pay. You have 1 score from each of the 3 major credit bureaus and a combination of the information is what most lenders use to determine your credit risk and is used in more than 90% of lending decisions. FICO scores range from 300 to 850 and the higher the better. A credit score of 720 will often qualify you for the best rate on a loan. Payment History- This includes paying your bills on time and has the biggest effect on your credit score. Late payments will stay on your credit for 7 years but will have the biggest impact on your score in the first 24 months. Amounts Owed- This considers your debt to credit ratio which is calculated by adding all of your debt on revolving credit lines (credit cards, store cards, overdraft lines of credit and home equity lines of credit) divided by the amount of revolving credit available to you. Try to keep your debt to credit ratio below 25% and the balance of each account below 25% of your available credit. 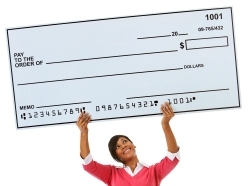 Length of Credit History- A long credit history will generally help your score. This factors how long accounts have been open (including your oldest account) and also averages the age of all your accounts. Opening too many new revolving accounts in a short period of time can hurt your score as well as closing an older account. New Credit- Having a recently opened account can help your credit score but multiple inquiries for credit in a short period of time can hurt your score. Multiple auto and mortgage loan inquiries (common when shopping around for the best rate) will generally count as one inquiry if completed within 30 days. Credit Inquiries will only affect your FICO score for 12 months but can remain on your credit report for 2 years. Types of Credit- This considers your mix of credit cards, retail accounts, student and car loans, and mortgages. Having credit cards and installment loans with a good credit history will raise your score. Not having credit cards can make you appear riskier to lenders than someone who manages their credit cards responsibly. This is only 10% of your score but will be more important if your credit report does not have a lot of other information to base your score on. –You can check each of your credit reports from the 3 bureaus for free once a year at annualcreditreport.com. Pull one report from each bureau every four months to check for inaccurate information or to see if anyone is using your personal identifying information. –Checking your own credit report is considered a “soft inquiry” and will not affect your credit score as long as you request it from annualcreditreport.com or another company authorized to provide credit reports to consumers. Hard inquiries are when prospective lenders or businesses pull your credit to offer you goods and services (like a credit card) and these inquiries can hurt your credit score. –If you find inaccurate information, tell the credit reporting company in writing. If you are a victim of fraud, call the three major bureaus to play a “fraud alert” your credit reports. –A closed account will still show up your credit report and closing an account can hurt your credit score. Paying off an account in collections will not remove a late payment from your credit score and can stay on your credit for 7 years. –Late payments on utilities can hurt your score if the servicers report to credit agencies and late payments can also cause creditors to raise interest rates. If your payments are late get current stay current. Set up reminders to help you pay on time or set up automatic payments. Read the materials about basic money management skills. Go to www.surveymonkey.com/s/cashcouse-pmmc and take the ten question quiz. e entered into the drawing for the prizes mentioned above! The three prizes were chosen for one reason: Basic necessities can be purchased with them. Gas prices are never fun to pay and food can be overwhelming, too. Participate in the scavenger hunt and expand your budget today! We are working our way into the fourth week of our 12-Week Money Challenge. Next week, it will be our goal for you to save $4. Now, that doesn’t sound like a lot of money but what are you willing to give up to make it happen? Fortunately, you won’t have to give up much! There are a couple easy ways to meet your savings goal next week. Break down your weekly goal into smaller daily goals. For instance, instead of trying to figure out how to save $4 on Saturday, you could save $0.57 each day! Start using cash and keep the change from daily transactions until you reach your goal. If all or nothing is your style, you could pack a lunch once a week instead of buying food on campus. The money you save will make it easy to get that $4 you need for the challenge. If you have a Starbuck’s addiction, try ordering one less coffee this week. I know for some of you this may be a stab to the heart! However, keep in mind that the average Starbuck’s order is $4 for a Grande. Be intentional about your savings plan. Set a goal and stick to it! If you can get your head around these small baby steps, you will set yourself up for success. It’s much easier to help yourself while in a financial crisis if you’ve practiced ways to save money in the past. Is saving money simply for your own peace of mind not quite enough to keep you motivated? Remember, the Personal Money Management Center is paying 2 students for this challenge! If you want a chance to win $234, keep on saving!!! Fun Activities On A Budget! Hello all you bloggers, this is Megan here. Want to do something that is fun and exciting, but don’t want to spend a ton of money? I will give you some ideas that can be done solo, with your sweetheart, or even with your little ones! Visit the local zoo, yeah the typical answer, but there are usually coupons throughout the year, so you just need to be on the watch! 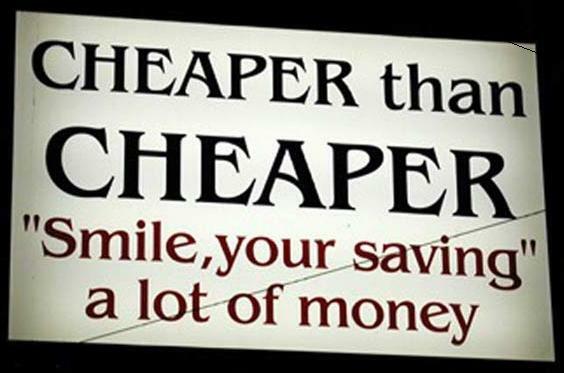 What is cheaper than free? Take an adventurous hike. Sounds bland, but you would be surprised. Plus you get that exercise in too! Throughout the year, there are many art festivals and museums that are usually really cheap or free. Check them out through your local newspaper or online. Who doesn’t like a free concert? You might be surprised when you ask your sweetheart to go to a concert instead of the usual dinner and overpriced movie. A lot of underground bands are super cheap, and don’t be discouraged if they are a no name, surprises are good! Most movie theaters have some sort of a classic series for an extremely low price. Taking advantage of these awesome deals, since most of them come with a package deal, can really save you money. The one in Salt Lake, is $30 for 6 movies that you can’t watch anywhere else! Want something fun to do with neighbors or friends? Instead of just going out to a restaurant and spending $20 a person, why not try a pot luck dinner? Have each family prepare one dish that serves everyone. It can be a fun way to entertain and save! On the topic of food, skip the restaurants and treat you and your sweetheart to a themed date night at your house. For instance, cook spaghetti and meatballs while sipping wine and watching Life is Beautiful. Cheap yet fun and interesting. Hope these ideas have helped and/or have sparked some new and exciting things you could do instead of the usual over priced routine! Hey everybody! I am Raynie one of the new interns at the PMMC! This is my first blog for you guys and I decided since I love vacations I would talk about a great way to save and budget for those of us who wanna go and get away! First of all I wanted to say HAPPY VALENTINES DAY! I hope you guys all had a good day with your sweethearts or if you don’t have a sweetheart still had some fun! Anyone and everyone should love going on a vacation I don’t care who you are! Most of you guys are probably students like me and are going to have a spring break coming up or your just wanting to take your special someone somewhere like me! Here are a few tips you can use to save for your vacation! 1) Start your planning early. If you are wanting to go somewhere that requires you to fly or buy a passport it is best to start planning sooner rather than later. Even if it is just driving you will need to save up some money separate from your planned budget for emergencies like taking a wrong turn that adds extra miles meaning more gas! You also can sometimes get better deals for hotels, airfare, and other things by planning far in advance. 2) Make a vacation savings account at your bank/credit union. This is something I have done for myself to help pay for tuition each semester. I just went to my bank and asked in my account for them to add a separate savings and titled it school. In this case you can do the same thing but with a title of vacations or something then each time you deposit a check you can add to it. 3) Give yourself an allowance before your vacation. By spending only the amount you give yourself to spend you stop yourself from impulse spending and only by things you really need and limit all the wants. By doing this you also are allowing yourself to have a set number to put away each month into your new vacation fund. It also really helps you see what you are spending your money on. 3) Start a layaway to help pay for your vacation. This is real! I have been looking myself for a vacation and many of the travel cites have started this. It is a way to pay for your vacation before you go on it. You can probably pay the amount you want for the amount of months you want. This keeps you from that large lump sum amount that forces many of us into using credit cards! 4) Do your homework. By this I mean for you to look for the vacation you want! Make sure if you are going to spend the money to get there it is everything you want it to be! Also by researching ahead of time this helps you from having to spend money on last minute fun time! 5) Save where you can! Things like packing your lunch everyday, riding the trax or walking rather than driving to school can really save you money. Why spend the extra money if you don’t have to? All those Mcdoubles that seem cheap only being $1.00 can really add up. Plus by doing these things you can also help your health! What is to lose just give it a try! As you may remember, in the month of January I decided to go on a 31 day money fast (if you missed it, you can check it out here). 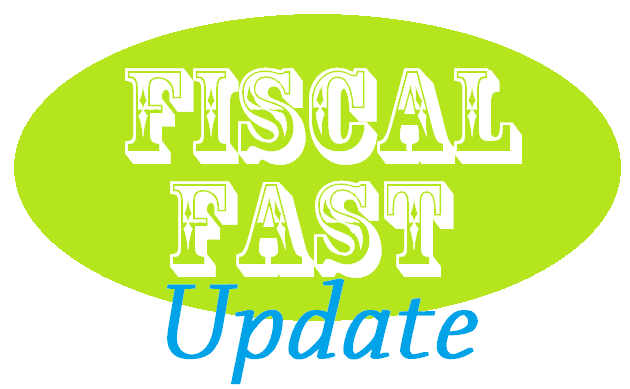 My fiscal fast was over as of February 1st but a lot of my habits have stuck with me. I now think twice before even browsing online stores, let alone mindlessly buying whatever my heart desires on Amazon. I have also been eating out a lot less and bringing my lunch to work a lot more. It is kind of fun to try cooking new foods at home and I’ve actually made a few things that are better than I have had at restaurants. The best part of my fiscal fast was that I was able to pay off 100% of my credit card debt that I ended up with after Christmas and a few household repairs. I had to pay tuition and replace my water heater in the month of January and I can still proudly say that I am credit card debt free and I’m working on building my emergency fund. I was not able to achieve all of my goals during my fast. I followed all of the rules to the letter of the law for about three weeks but then I broke down and went out to lunch. After that it was hard to keep going and I ate out a few more times. I also spent more than my $50 grocery budget goal (about 4x times more) but I ate mostly healthy foods. I wasn’t perfect but it is really hard to not spend anything for a whole month. I am still really glad I did it because it feels great to be debt free and I feel like it was just the thing I needed to become more aware of my negative spending habits. As a result of my fast, my impulse shopping is under control and I’m just making better money decisions. This definitely won’t be my last fiscal fast. Valentine’s Day (or if you’re like me, Single Awareness Day) is less than two weeks away. Many people have the misconception that the more money they spend on their significant other, the more romantic it is. Oh, if it were only that easy! Here are a few ways to impress the love of your life and not depress your wallet. Creating a heart-felt, homemade card with homemade treats (like brownies, chocolate strawberries, etc.) is much more meaningful to your love than running to the local supermarket and purchasing a box of chocolates with an overpriced card. You could easily save five to twenty dollars depending on how big a box of choc olates you purchased in the past. An entire night of servitude including cooking dinner, watching a romantic movie, and even foot rubs can really help your budget. The savings could be substantial if you decide to pass up the Filet Mignon at a fancy restaurant and prepare it yourself. 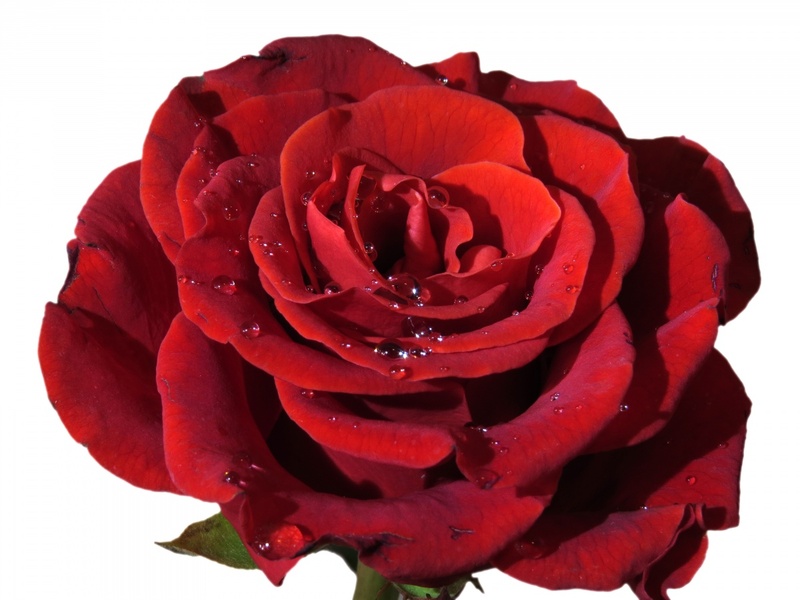 Do your best to avoid purchasing flowers at a specialized shop. It may cost you upwards of $75 for the bouquet and vase vs. going to your local grocer, purchasing a similar bouquet and vase for a fraction of the cost. If you and your significant other enjoy physically fit activities, do something fun like going to a trampoline park or take a hike (bundle up, it’s cold out there!) If you decide on the trampoline park, you may be competing with younger kids for jumping space, but chances are you won’t notice since it’s so fun. More often than not, your sweetheart will have a wonderful Valentine’s Day regardless of the cost. If you pay attention and care for them, you can also pay attention and care for your budget.